Nancy and Henry Oseran have shared many rich experiences during their long marriage. They have raised a son, Dan, and daughter, Laurie, and have four grandchildren. Both are from the Northwest: Nancy is a native of Portland and Henry is from Seattle. They met when they were just 17 years old at the University of Washington. The Oserans have always shared in being part of Jewish life in Portland. 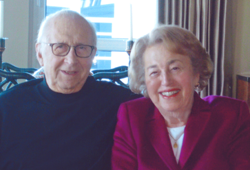 Their connections are deep and their active engagement in the community through Congregation Beth Israel, Jewish Federation of Greater Portland and through their philanthropic fund at the Oregon Jewish Community Foundation have made a lasting difference. "I was born into Jewish life and it's been a joy to have the kind of strong relationship I had as a girl and in my family. I just grew up into doing more," comments Nancy. "My parents were very committed to Zionism and my mother was president of Hadassah. She was also involved in the then Jewish Welfare Federation, chairing the Women's division." Nancy remembers attending religious school at Beth Israel and has served on the Sisterhood board and the congregation board as well, among her many volunteer roles. Through the years, Henry has been at her side and has also enjoyed their involvement in the community. Henry and Nancy have shared the quiet joy of giving generously to help others in need and to strengthen our Jewish community for future generations. Their expression of philanthropy is sure to inspire others to do the same.